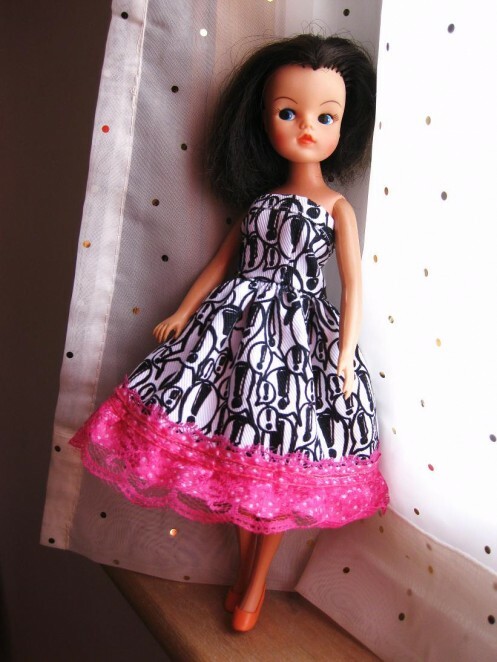 There was just enough fabric in this tiny remnant of exclamation mark fabric from Broadway Market haberdashery Our Patterned Hand to whip up this little Sindy dress. I stumbled on the shop by chance and was quite tempted by all the lovely dress fabric, but just chose this remnant and a couple of metres of rainbow coloured bias binding to feed the hungry haberdashery stash monster under my desk. The pink ruffled trim is from The Wool Shop, an even more astonishing haberdashery in Walthamstow Market. Really it is quite unreasonable of London to have so many tempting haberdashery shops, now I want to go shopping again and collect all the things. What a fabulous dress – I want one for myself! Once this pesky Olympics shennanigans is over, I think a trip to Our Patterned Hand might be in order. Pink Harris Tweed! !